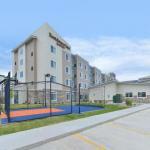 Boasting complimentary breakfast and free Wi-Fi an indoor pool and fully equipped kitchens the non-smoking Residence Inn by Marriott - Champaign is located less than four miles from the University of Illinois and the center of Urbana. Spanning four floors Residence Inn by Marriott houses 112 rooms all with free Wi-Fi fully-equipped kitchens separate sleeping and living areas sofa beds 37-inch flat-panel TVs and hairdryers. Rise and shine with the hotel's complimentary full breakfast buffet or take a morning dip in the indoor pool. Squeeze in a workout at the fitness center or a soak in the indoor hot tub. Mingle over complimentary drinks and snacks at the hotel's evening receptions get some fresh air at the outdoor picnic area or freshen your belongings in the laundry center. Parking is free and up to two pets are welcome for an extra charge. Conveniently located off I-74 Residence Inn by Marriott is within four miles of the University of Illinois Urbana-Champaign Memorial Stadium and Research Park as well as three miles from Parkland College and its Staerkel Planetarium. Guests are also one mile from Market Place Mall shopping. University of Illinois Willard Airport is eight miles away and Central Illinois Regional Airport is 48 miles away.